The three children of an NYPD cop gunned down in the Bronx said they were moved that President Trump met with them to honor her sacrifice. 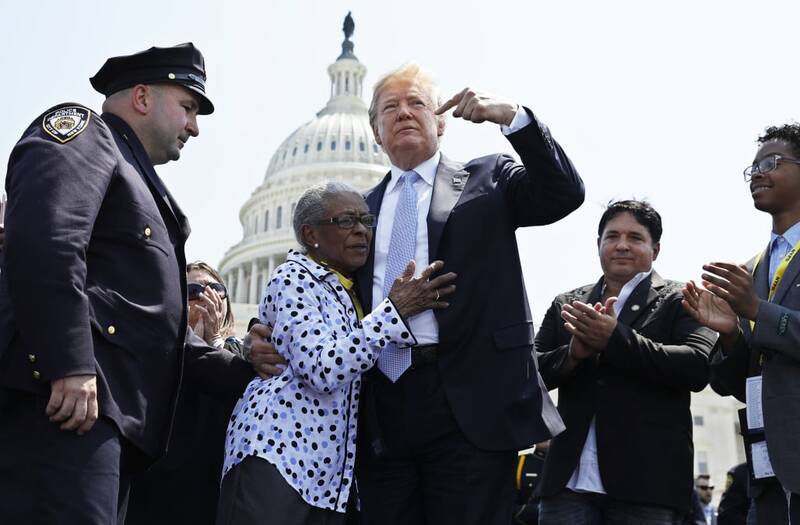 Genesis Villella and her siblings Peter and Delilah appeared on CNN Wednesday after Trump called them to the stage Tuesday during an address honoring slain police officers in Washington, D.C.
Their mother Miosotis Familia, 48, was gunned down in July by a maniac bent on killing cops. “My mother was really brave and it being highlighted is pretty nice, because as a cop you have to meet those standards of bravery and you have to have the heart to protect the city,” Peter, 13, said. Villella, 21, told CNN she was very aware of the danger her mother faced every time she went to work. “In spite of that she loved going to her job every day. She wanted to protect new Yorkers,” Villella said, her voice cracking. Trump spontaneously invited the family to the dais during his speech. During the event, Familia’s partner Vincent Maher recalled her courage in returning to work following an injury. Familia was sitting in a mobile command post at E. 183rd St. and Morris Ave. when Alexander Bonds, 34, shot her through a window about 12:30 a.m. July 5. Bonds fled but was later shot dead by police.